the primer dust that's choking your lungs. Rally II size codes and meanings. 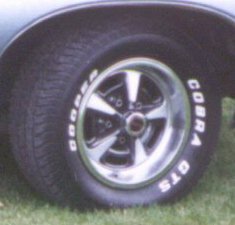 Sources where you can buy restored Rally II wheels, nuts, trim rings. Looking for contributors to the article. Email me! people asking as much as $500 for a set of (4) of these Trim Rings. (Part #9781480). This is the 'Brushed' finish. 'Polished' finish. These were both 4 clip, 14x6 Trim Rings. ridge design, finish and fit are all variations. currently available.. from who... and how they rate (appearance/fit). (3) Cleaned the wheels. Blew them dry with compressed air. (4) Masked off the tire with masking tape and newspaper. (5) Primed the wheels with Rust-Oleum spray cans from the hardware store. Choked on the fumes since I wasn't wearing a respirator mask! (6) Custom-mixed a batch of gray. My Dad had a good eye for tinting colors. masked around the the edges of the parts that were to be silver. under a 150 watt heat lamp overnight. (10) Installed finished wheels on the car. They looked very nice! cheap trim rings in the trash. Erik Hutters for creating the moving wheel logo at the top of this page!